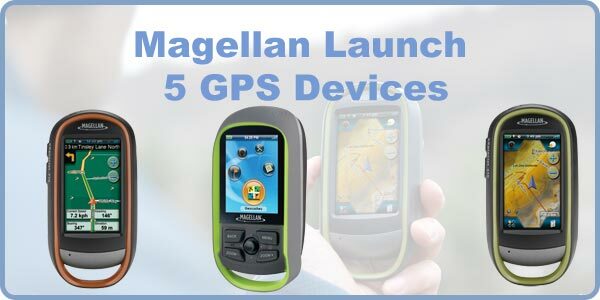 Yesterday in London Magellan re-launched it's brand of outdoor GPS devices in the UK. For those of you who are keen fans of PocketGPSWorld.com you will know that over the years we have reviewed some Magellan products, but they were difficult to get in the UK. Well that has changed now, with major retailers like Cotswold and Amazon stocking and selling the devices there is now some serious competition to Garmin in the outdoor GPS market. Magellan have introduced 5 GPS enabled devices in 3 different ranges: the eXplorist x10 handhelds, the eXplorist GC handheld GPS and the ToughCase for iPhone/iPad. With recommended prices ranging from �180 to �500 the pricing is roughly comparable (though slightly higher) than the equivalent Garmin Oregon. The Magellan x10 range consists 3 devices: the 510, 610 and 710. All of these share the same form-factor and are differentiated by the mapping data, the 610 and 710 also feature an electronic compass and barometer. All the devices have a 3" touch screen, microSD slot, 3.2M camera, speaker and microphone. The camera allows you to take a georeferenced picture, the microphone allows you to add a voice note to a POI, and the speaker is used for Turn by Turn street routing. The 510 comes with a basic World Edition map, the 610 adds the Summit Series Topographical map, and the 710 adds the Navteq City Series mapping for turn by turn road navigation. The Magellan ToughCase is an extoskeleton for the iPhone 3/3GS and iPod Touch priced at �180. It has IPX-7 certification for waterproofness (1m water for 30 minutes) and incorporates an internal battery to charge your device. The biggest benefit of the ToughCase though is a SiRFStarIII GPS which enhances the lower performing iPhone GPS. This has been available in the USA for some time and we reviewed it last year. Click here for our Magellan ToughCase review. This just leaves us with the last device the Magellan eXplorist GC. This is a handheld GPS specifically designed for the GeoCaching enthusiast. It sports a somewhat smaller 2.2" TFT screen which is not touch sensitive. To control the device there are 4 buttons and a combo joystick/action button. Again this is an IPX-7 rated device, essential for use in the British summer. Although the GC can be used as a conventional GPS it has been designed as a dedicated geocaching system and had features specifically for the sport. These include the integration of specific geocaching information, and a seamless (computer) link to www.geocaching.com the World leading geocaching database community. The entire system provides a paperless geocaching experience. The Magellan eXplorist GC is priced at �180. Full details of the Magellan Handheld GPS on the Magellan Outdoor Navigation site. London, UK, May 12th 2011 � Global GPS brand Magellan today makes its return to the UK market with the launch of a new range of high quality handheld GPS devices for all kinds of outdoor adventure. Whether hiking, climbing, backpacking, geocaching, hunting, fishing, mountain biking or sailing, the eXplorist series has been designed to allow adventurers to navigate to outdoor destinations worldwide, capture geotagged photos along the way, and share their experiences online when they return home. Each eXplorist model combines high-sensitivity GPS, an intuitive user interface, easy-to-read mapping and accurate navigation. The eXplorist GC device is also dedicated to the outdoor GPS treasure hunting phenomenon of geocaching. The devices, along with the Magellan ToughCase for iPhone 3G and iPod Touch, are available in UK stores, including Cotswold Outdoor, now. In addition, the eXplorist 610 and 710 feature a 3-axis electronic compass and a barometric altimeter that provide precise orientation, accurate elevation information, and enables for weather pattern tracking. The eXplorist 710 meanwhile combines the best of on-road and off-road navigation, including both Magellan�s highly detailed Summit Series topographic map and its City Series turn-by-turn map which allows users to navigate their vehicles through busy city streets on their way to their outdoor adventures. The ToughCase is compatible with iPhone 3G, iPhone 3GS and iPod touch (second and third generation).